جهت استفاده از بتن به عنوان یک ماده ساختمانی با کاربردهای متعدد، می بایست به خواص مکانیکی و دوامی آن توجه شود. خواص مکانیکی شامل مقاومت فشاری، کششی، خمشی و سایشی بوده و خواص دوامی شامل مقاومت در برابر حمله سولفات ها و کلریدها می باشد. در تمامی موارد ذکر شده میزان هوای غیرعمدی بتن، رابطه ای ویژه با خواص مکانیکی و دوامی آن دارد. در تحقیق پیش رو به بررسی این رابطه و همچنین تاثیر مواد افزودنی شیمیایی و طبیعی شامل زئولیت، متاکائولن، میکروسیلیس و درصد های مختلف روان کننده بر روی هوای بتن پرداخته شده است. نمونه ها با آزمایشات دما، اسلامپ، هوای بتن، نفوذپذیری آب، مقاومت الکتریکی، جذب آب و مقاومت فشاری برای سنین 7، 28 و 90 روز، مورد ارزیابی قرار گرفتند. نتایج نشان داد بتن حاوی میکروسیلیس و زئولیت به ترتیب کمترین میزان هوا را دارد. در رابطه با جذب آب، نمونه دارای متاکائولن و زئولیت به ترتیب بیشترین، در مورد نفوذ آب، بتن حاوی میکروسیلیس و متاکائولن به ترتیب کمترین، در آزمایش مقاومت الکتریکی 7 و 28 روز، نمونه شامل متاکائولن و زئولیت و در 90 روز، نمونه حاوی زئولیت و میکروسیلیس به ترتیب بیشترین، در مورد مقاومت فشاری نیز نمونه دارای میکروسیلیس و متاکائولن به ترتیب بیشترین بوده که نمونه حاوی زئولیت در 7 روز مقاومت کمی از خود نشان داد که در سنین بالاتر رشد نسبی بهتری داشت. همچنین می توان به این نتیجه رسید که با افزودن میکروسیلیس و 1.5% روان کننده به نمونه بتن، کمترین میزان هوای بتن و بیشترین مقدار مقاومت فشاری حاصل گردد. در مجموع نتایج نشان داد، اگر میزان هوای بتن را کاهش دهیم به صورت مستقیم یا غیر مستقیم می توان خواص مکانیکی و دوامی بتن را افزایش داد و بایستی تلاش نمود با کاهش نفوذپذیری و هوای بتن، کارایی و توانمندی بتن را افزایش داد. In order to use concrete as a building material with multiple applications, its mechanical and durability properties should be considered. Mechanical properties include compressive, tensile, flexural, and abrasive strength. And, the durability property, here, is defined as the resistance to sulfates and chlorides attacks. For all these situations, concrete porosity relates to the mechanical strengths and durability resistance in a specific way. In this study, these relations as well as the effect of chemical and natural additives; including Zeolite, Meta Kaolin, Micro Silica, and Plasticizers with different percentages; are investigated. To do this, specimens are compared in terms of temperature, concrete slump, porosity, permeability, electrical resistivity, water absorption, and compressive strengths of 7, 28, and 90 days. Results showed low levels of porosity for concretes with Micro Silica and Zeolite, respectively, high water absorptions for those with Meta Kaolin and Zeolite, respectively, and low levels of permeability for those of Micro Silica and Meta Kaolin, respectively. High electrical resistivity is found for the samples containing Meta Kaolin and Zeolite, after 7 and 28 days, and for the samples containing Zeolite and Micro Silica, after 90 days. Concrete samples containing Micro Silica and Meta Kaolin showed high levels of compressive strength. In this regard, although, Zeolite-concrete mixture had showed low level of compressive strength after 7 days, it was improved after more days. It is also concluded that a mixture of concrete with Micro Silica and 1.5% of plasticizer has the lowest level of porosity and the highest level of compressive strength. All these proved that, generally, reducing porosity improves mechanical and durability properties of concrete. ولی پور مهدی، پرگر فرهاد، (1389)، مطالعه آزمایشگاهی نفوذپذیری گاز در بتن های توانمند حاوی پوزولان های متاکائولن و میکروسیلیس، دومین کنفرانس ملی بتن ایران. سید رزاقی مهران، امینی کامران، مهدی پور ایمان، باریک بین وحید، الهیاری میثم، (1390)، تاثیر جایگزینی سیمان با متاکائولن در خواص رفتارشناسی و مکانیکی ملات خودتراکم، ششمین کنگره ملی مهندسی عمران. جاویدان محمد مهدی، زمانی ابیانه محمدرضا، (1391) تاثیرات همزمان استفاده از زئولیت و متاکائولن بر خواص بتن، چهارمین کنفرانس ملی سالیانه بتن ایران. شکرچی زاده محمد، میردامادی علیرضا، بنکدار ابوذر، بخشی مهدی، (1387)، بهبود خواص بتن های توانمند با استفاده از متاکائولن، مجله تحقیقات بتن، 1: 55-63. رمضانیانپور علی اکبر، کلهری موسی، موسوی سیده رحیمه، (1391)، زئولیت و اثر آن بر مقاومت خمیر و ناحیه انتقال، چهارمین کنفرانس ملی بتن ایران. پیکرنگار میثم، رنجبر ملک محمد، مدندوست رحمت، (1389)، بررسی دوام بتن حاوی متاکائولن و خاکستر بادی، پنجمین کنگره ملی مهندسی عمران. Bagheri A, Farrokhi F, Mahdikhani M, Farokhzad R, Baghdadi J. (2016). Representing Appropriate Aggregates Grading Zone For Self-Consolidating Concrete by Using Soil Classifying Parameters, Journal of Concrete Research, 7, 2:31-46. Farokhzad R, Yaseri S, Entezarian MH, Yavari A, (2016). Investigating Effects of Sulfates on Compressive Strength of Different Types of Pozzolan Concrete and Measuring Penetration Rate by Ultrasound Tests at Different Ages, Journal of Concrete Research, 9, 1:113-130. Piasta Wojciech, Sikora Hubert, (2015). Effect of air entrainment on shrinkage of blended cements concretes, Construction and Building Materials, 99:298–307. Mahoutian Mehrdad, Lubell Adam S, Bindiganavile Vivek S, (2015), Effect of powdered activated carbon on the air void characteristics of concrete containing fly ash, Construction and Building Materials, 80: 84–91. Neves R, Sena da Fonseca B, Branco F, de Brito J, Castela A, Montemor M.F, (2015), Assessing concrete carbonation resistance through air permeability measurements, Construction and Building Materials, 82: 304–309. BS EN 12390-3, (2009). Testing hardened concrete, Compressive strength of test specimens. ASTMC33, (2010), Standard Specification for Concrete Aggregates. Jelokhani Niaraki, R., & Farokhzad, R. (2017). Prediction of mechanical and fresh properties of self-consolidating concrete (SCC) using multi-objective genetic algorithm (MOGA). Journal of Structural Engineering and Geo-Techniques, 7(2), 1-13. CEB-FIP, (1989), Diagnosis and assessment of concrete structures state of the art report. CEB Bull 192; 835. Farokhzad, R., Mahdikhani, M., Bagheri, A., & Baghdadi, J, (2016). Representing a logical grading zone for self-consolidating concrete. Construction and Building Materials, 115: 735-745. Angelin, A.F., Lintz, R.C.C., Gachet-Barbosa, L.A. and Osório, W.R., (2017). The effects of porosity on mechanical behavior and water absorption of an environmentally friendly cement mortar with recycled rubber. Construction and Building Materials, 151:534-545. Šeputytė-Jucikė, J. and Kligys, M., (2016). The effects of modifying additives and chemical admixtures on the properties of porous fresh and hardened cement paste. Construction and Building Materials, 127: 679-691. 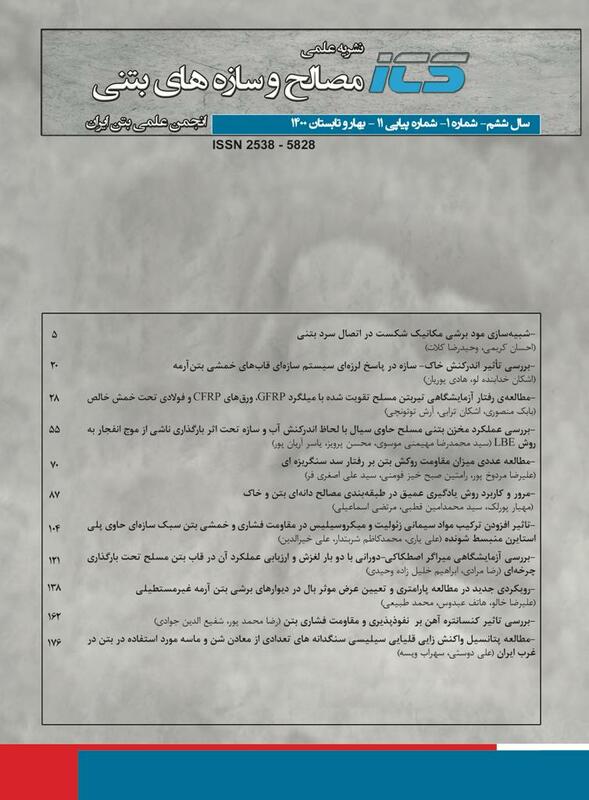 Yaseri, S., Hajiaghaei, G., Mohammadi, F., Mahdikhani, M. and Farokhzad, R., (2017). The role of synthesis parameters on the workability, setting and strength properties of binary binder based geopolymer paste. Construction and Building Materials, 157: 534-545. Samimi K, Kamali-Bernard S, Maghsoudi AA, Maghsoudi M, Siad H. (2017). Influence of pumice and zeolite on compressive strength, transport properties and resistance to chloride penetration of high strength self-compacting concretes. Construction and Building Materials, 151:292-311. Siddique R, Klaus J. (2009). Influence of metakaolin on the properties of mortar and concrete: A review. Applied Clay Science, 43,3:392-400.